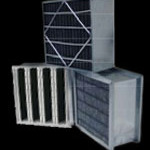 HVAC carbon system filters. Available in five dry process carbon composite (DPCC) media grades of carbon. 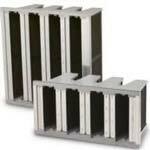 Rigid or V cell style with a galvanized steel framing and a header are most commonly used. Also available with a fire retardant ABS plastic end plates framing with a header. 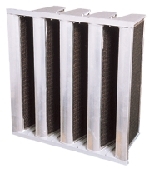 Self-supporting Rigid Cell Filters remove odors, VOCs, and light gases. Units are available with granular activated carbon or 50/50 blend of carbon and activated alumina impregnated with 5% potassium permanganate. 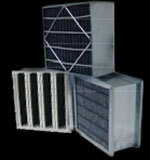 Filters are 24 x 24 x 12 in., pleated, and provide 7 lb of GAC or 8.6 lb of 50/50 adsorbent blend. Galvanized steel frames resist corrosion in moist, humid conditions, and are available with or without header.